The 1976 Republican presidential primaries were a series of contests held to elect delegates to the 1976 Republican National Convention, held to nominate a candidate for President of the United States in the 1976 election. 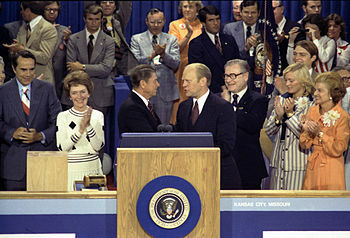 Incumbent President Gerald Ford was selected as the nominee through a series of primary elections and caucuses culminating in the 1976 Republican National Convention held from August 16 to August 19, 1976, in Kansas City, Missouri. 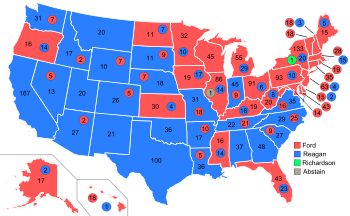 The 1976 election marks the first time that Republican primaries or caucuses were held in every state; the Democrats had previously done so in 1972. This also marks the last election in which the Republican nominee was undetermined at the start of the party's National Convention. This was the last time during the 20th century that a primary season had ended without a presumptive nominee. Following the Watergate scandal and resignation of President Richard Nixon, Vice President Gerald Ford was elevated to President on August 9, 1974. Because Ford had been appointed Vice President by Nixon following the resignation of Spiro Agnew from the position, he became the only president inaugurated without having been previously voted into either the presidential or vice presidential office by the Electoral College. Race and education divided public opinion, especially over issues such as forced integration and changes to public school curriculum. Political violence over education policy broke out in Boston and Charleston, West Virginia. Abortion also became a nationally salient issue after the Supreme Court's Roe v. Wade decision, which was announced two days after Nixon's resignation and struck down state restrictions on abortion nationwide. In the 1974 midterm elections, the Democratic Party dramatically expanded its majorities in both the House and Senate. The elections were seen as a referendum on the Republican Party post-Watergate and on the political establishment more generally. Newly-elected members of Congress became known as "Watergate Babies" and aggressively pursued procedural and oversight reforms. During this period, Ronald Reagan concluded his second term in office as Governor of California. His administration was marked by efforts to dismantle the welfare state and a high-profile crackdown on urban crime and left-wing dissent, especially at the University of California, Berkeley. He also led an effort to enforce the state's capital punishment laws but was blocked by the California Supreme Court in the People v. Anderson decision. Following Reagan's retirement from office in January 1975, he began hosting a national radio show and writing a national newspaper column. Discontent reached a fever pitch at the second annual Conservative Political Action Conference in February. Speaking there, Reagan dismissed calls to seek the presidency on a third-party ticket: "Is it a third party that we need, or is it a new and revitalized second party, raising a banner of no pale pastels, but bold colors which could make it unmistakably clear where we stand on all the issues troubling the people?" Speakers at CPAC also criticized Ford administration policy, Vice President Rockefeller, and First Lady Betty Ford's public campaign in support of abortion and the Equal Rights Amendment. In March, discussion began to build around Reagan's presidential prospects following an appearance on The Tonight Show and a profile in Newsweek that called him, "the most kinetic single presence in American political life." In defense, the administration drafted a letter of support for President Ford that received the signatures of 113 of 145 GOP Representatives and 31 of 38 Senators. :440-442 Ford formally announced he would run for re-election on July 8. More than any domestic issue in 1975, foreign policy drove a wedge between the President and his conservative critics. Following the American evacuation of Saigon and the collapse of South Vietnam, these criticisms grew vociferous. On his radio show, Reagan compared the withdrawal from Saigon to the Munich Agreement and warned that it would "tempt the Soviet Union as it once tempted Hitler and the military rulers of Japan. ":432 While Ford regained some support from conservatives following the rescue of the SS Mayaguez in Cambodia,:464-5 he soon drew the ire of the party's right wing with a series of foreign policy moves designed to improve relations with the Soviet Union. First, President Ford refused to meet with Soviet dissident Aleksandr Solzhenitsyn on his visit to the United States on June 21. In response, Reagan publicly criticized Ford by name for the first time in his national newspaper column, contrasting the popular Solzhenitsyn to other " guests the President had entertained in the White House, "the Strawberry Queen of West Virginia and the Maid of Cotton. ":488 The day after this column ran, Senator Paul Laxalt announced the formation of a committee named "Friends of Ronald Reagan,":489 organized for the purpose of drafting Reagan to run for President. On August 24 in Sacramento, Ford survived the first of two attempts on his life by lone assassins. :497-99 A second attempt followed on nineteen days later on September 21.:509 Neither assassin struck Ford. Ford narrowly defeated Reagan in the New Hampshire primary, and then proceeded to beat Reagan in the Florida and Illinois primaries by comfortable margins. By the time of the North Carolina primary in March 1976, Reagan's campaign was nearly out of money, and it was widely believed that another defeat would force Reagan to quit the race. However, assisted by the powerful political organization of U.S. Senator Jesse Helms, Reagan upset Ford in North Carolina and then proceeded to win a string of impressive victories, including Texas, where he carried all twenty-four congressional districts and won all ninety-six delegates at stake in the state's first binding primary. Four other delegates chosen at the Texas state convention went to Reagan and shut out U.S. Senator from Texas John G. Tower, who had been named to manage the Ford campaign on the convention floor. Ford bounced back to win in his native Michigan, and from there the two candidates engaged in an increasingly bitter nip-and-tuck contest for delegates. By the time the Republican Convention opened in August 1976 the race for the nomination was still too close to call. The 1976 Republican National Convention was held in Kansas City. As the convention began, Ford was seen as having a slight lead in delegate votes, but still shy of the 1130 delegates he needed to win. Reagan and Ford both competed for the votes of individual delegates and state delegations. In a bid to woo moderate Northern Republicans, Reagan shocked the convention by announcing that if he won the nomination, Senator Richard Schweiker of Pennsylvania, from the northern liberal wing of the party, would be his running mate. The move backfired, however, as few moderates switched to Reagan, while many conservative delegates were outraged. The key state of Mississippi, which Reagan needed, narrowly voted to support Ford; it was believed that Reagan's choice of Schweiker had led Clarke Reed, Mississippi's chairman, to switch to Ford. Ford then won the nomination, narrowly, on the first ballot. He chose Senator Robert Dole of Kansas as his running mate. After giving his acceptance speech, Ford asked Reagan to come and say a few words to the convention. The 1976 Republican National Convention at Kemper Arena in Kansas City. Vice Presidential Candidate Bob Dole is on the far left, then Nancy Reagan, former Governor Ronald Reagan is at the center shaking hands with President Gerald Ford, Vice President Nelson Rockefeller is just to the right of Ford, followed by Susan Ford and First Lady Betty Ford. 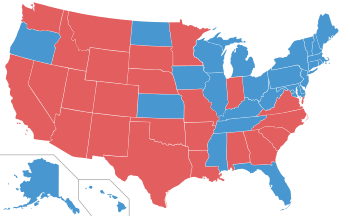 First ballot vote for the presidential nomination by state delegation. President Ford chose Senator Robert J. Dole of Kansas as his running mate, while Reagan chose Pennsylvania Senator Richard Schweiker. ^ a b Based on Time Magazine estimate prior to the 1976 convention; both candidates were short of the needed 1,130 delegates. "Another Loss For the Gipper." CNN AllPolitics "Back in TIME" series. Retrieved 2016-03-24. ^ a b c d e f g h i j k l m n o p q r s t u v w x Perlstein, Rick (2014). The Invisible Bridge: The Fall of Nixon and The Rise of Reagan (1 ed.). Simon & Schuster. ISBN 978-1-4767-8241-6. ^ Baker, Donald P (November 9, 1975). "Mathias Says He May Run In Presidential Primaries". The Washington Post. p. 21. ^ Will, George (January 25, 1976). "Sen. Mathias' 'Stroll'". The Washington Post. p. 131. ^ Peterson, Bill (February 8, 1976). "The Quiet Presidential Campaign". The Washington Post. p. 21. ^ Peterson, Bill (March 3, 1976). "Mathias Joins Almost-Rans, Will Not Seek Presidency". The Washington Post. p. A3. ^ Peterson, Bill (June 26, 1976). "Dissident Mathias Denied GOP Platform Committee Post". The Washington Post. p. A5. ^ Logan, Harold J (August 19, 1976). "Mathias' Convention Role Is Low-Key". The Washington Post. p. 14. This page was last edited on 5 March 2019, at 03:08 (UTC).